90-minute expedition over the roof of the world's no.1 entertainment venue, The O2. Climb suit. Boots. Harness. Latch. Clip onto the walkway and go on up. Your climb guide will be with you every step. Get unobstructed panoramic views over London from the top of the O2. Intrepid climbers will be rewarded with an eyeful during this 1.5-hour adventure atop the famous entertainment venue. 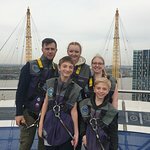 Equipped with a climb suit, boots, harness and latch, follow your adventure guide to the apex of the building to look down upon Canary Wharf, the Olympic park and historic Greenwich. No climbing experience is necessary. Make your way to The O2, located near the North Greenwich Station tube stop, and find the Up the O2 Basecamp. Meet your experienced climbing guide and group of fellow thrill seekers. Listen to a safety briefing and orientation to the 170-foot (52-meter) structure that is home to a variety of restaurants and entertainment options, and is the world's busiest music venue. Get fitted for a climb suit, boots, harness and latch. After the briefing, latch in to the safety system and begin the steep ascent, which reaches up to 30 degrees. Make it to the top of the dome for 360-degree views over London, including both the north and south of the winding River Thames. See the historic grounds of Greenwich, Queen Elizabeth Olympic Park and the skyscrapers of Canary Wharf. You're not done yet; the descent is part of the thrill. Your experience ends safely back at the base camp after 1.5 hours. 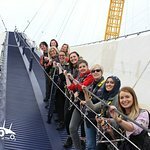 Get quick answers from Up at The O2 Climb in London staff and past visitors.